Thank you Brenda from Brenda'sjoy for this award. How thoughtful of you to think of me. 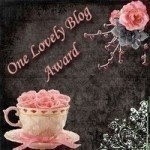 I will be passing this award on shortly.... Again.. thank you so much, I appreciate your thoughtfulness!